The article reported on the prosecution of a Dallas resident indicted for robbery committed in Cass County. The primary source of information for the Dallas Journal publication was Fred Harris an attorney for the defendant who practiced in Dallas. 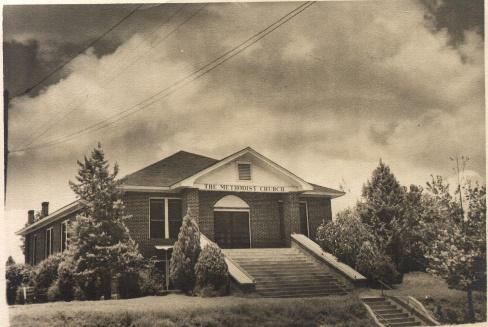 According to Harris when he reached Linden he learned that the trial would take place in the basement of the 1927 Methodist Church understanding the courthouse “had fallen in”. He ridiculed the furniture provided for the judge, attorneys and jurors. He claimed, during the trial 2 jurors got sick and the sheriff died creating unforeseen delays. In spite of the circumstances, Harris said he was not worried. The jury did not convict his client but was discharged after voting nine to three for acquittal. Harris said he expected the case not to be retried. Enraged by the unfair report in the Dallas Journal, County Judge Sam L. Henderson penned a letter to its editor republished with the Dallas Journal article in the Cass County Sun that demanded a retraction. He claimed about the only truthful statement in the Dallas Journal article was that “the District Court was being held in a Church” due to the Courthouse having been damaged by fire in 1933. Most of its content was a “scurrilous and false attack” upon the citizens and the justice system of Cass County. It is true when the evidence was closed and the case was about to go to the jury, the Sheriff, E. Lois Johnson, died of appendicitis. The trial was delayed until the following week when his wife was appointed to serve the few remaining months of his term. (Technically, she was the first female sheriff of Cass County) According to Judge Henderson, all that happened should not imply there was no evidence of guilt against the defendant. Although the trial resulted in a “hung jury”, Judge Henderson assured the readers that Mr. Harris’s client would be tried again in Linden, with courtesy shown to Mr. Harris, and felt, after conviction, his client would be turned over to other counties to be tried for other crimes. Judge Henderson requested his letter be printed in bold type under the heading, “Cass County Challenges and Answers the False Article Published in the Paper about Cass County”. After receipt of the letter, the Dallas Journal printed a retraction as requested by Judge Henderson. Credit is given to Gail Dorgan for providing this interesting history of Linden. Transcriptions by Catherine Knapp and Joe Lovelace. Read the transcription of each publication in the Documents section (Dallas Journal) of this website. All rights to text and images appearing on this site are reserved and may not be used without written permission.